Providing you the best range of non ionic spray adjuvant and organo silicone based super spreader with effective & timely delivery. FIXER AG being nonionic surfactant is often used with systemic pesticides, help pesticide sprays penetrate plant cuticles. Most pesticides are stable between pH 5.5 & 7.0 (slightly acidic to neutral).Above pH 7.0, the pesticide may be subject to degradation by alkaline hydrolysis. The more alkaline the mixture, the greater the risk of degradation. FIXER AG has buffering action that lower the pH of the water in the spray tank. FIXER AGtend to stabilize the pH at a constant level. FIXER AGis a non ionic spray adjuvant. It can be used as a tank mix along with insecticides, fungicides, herbicides, plant growth regulators & foliar fertilizers to increase their efficacy. 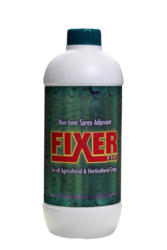 FIXER AGcontains “Non- ionic surfactant” as an active ingredient that break down the surface tension of the water causing the water droplets to spread out on the leaf surfaces. Addition of FIXER AGhelps the Agrochemical & Fertilizers to penetrate the leaf surface faster & more evenly. This results in better pest / disease control and thus better yield. Foliar Spray:- 100 to 200ml per 200 liter of water & to be added at last in the spray solution. Compatibility :-FIXER AG is compatible with most pesticides & most EPA registered pesticides that require a spray adjuvant recommend a nonionic one like Fixer-AG. ORSIL is a polyether trisiloxane based spray adjuvant. It gives super spreading & dramatically reduces surface tension of spray solution. Therefore the performance of the pesticides & fertilizers is significantly enhanced. Superior wetting of hydrophobic surfaces, particularly leaves & other plant parts. Better absorption of nutrients &systemic pesticides through cuticular waxes. Compatibility :-ORSIL is compatible with almost all agrochemicals. Packing :- 40ml, 100ml, 250ml, 500ml, 1Ltr 5Ltr. Looking for SPRAY ADJUVANTS ?